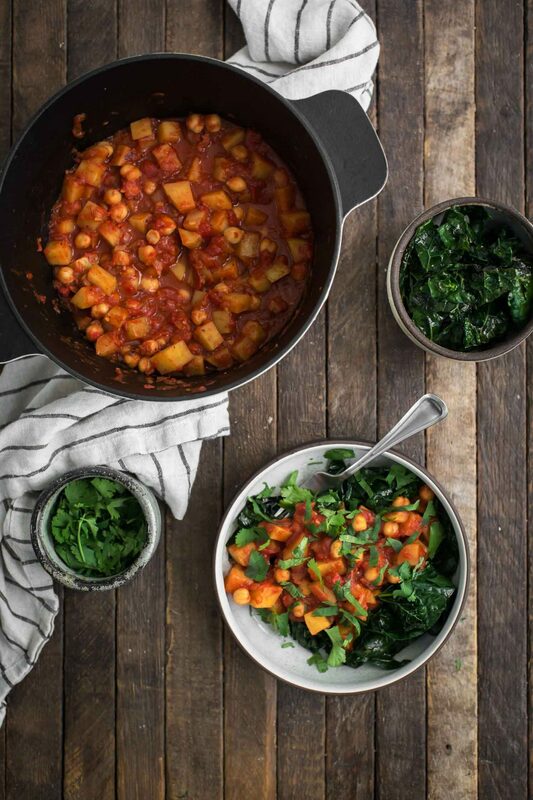 Harissa Potatoes over Garlicky Kale | Naturally. In my kitchen, I have two pantry drawers devoted to produce storage: one for alliums and one for potatoes. Both are always stocked, ready to make any meal. As such, I have an arsenal of recipes that use these ingredients. I’ve made harissa potatoes before but this meal is a bit more substantial with help from chickpeas and crushed tomatoes. These harissa potatoes are also wonderful reheated the next day. 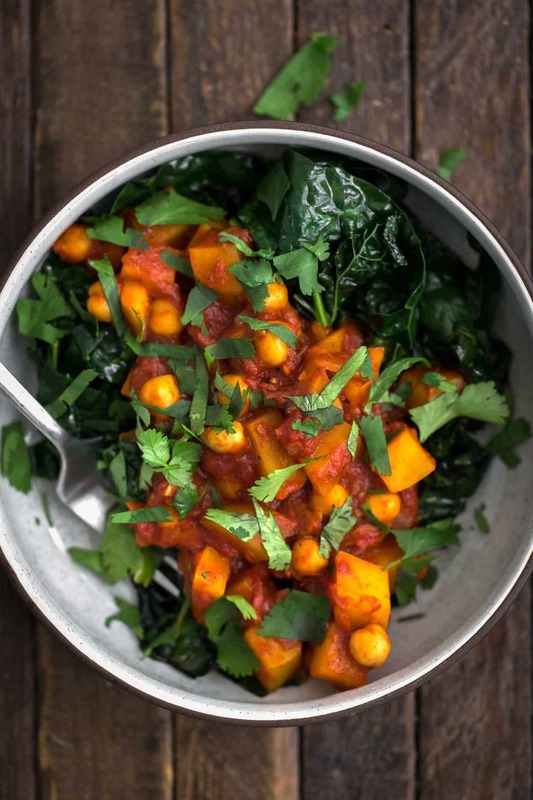 A well-balanced vegan dinner using potatoes cooked in a rich, harissa tomato sauce and rounded out with chickpeas. Heat a dutch-oven or heavy-bottomed pan with lid over medium-low heat. Add the olive oil followed by the onions. Saute until the onions are tender and fragrant, 5 to 6 minutes. Stir in the garlic and cook for a minute more. Cut the potatoes into a ¼” dice and add to the pan along with the vegetable broth. Cover, reduce heat, and let cook until the potatoes are starting to get tender, 6 to 8 minutes (depending on the size of the potatoes). Add the crushed tomatoes and harissa to the pan. Bring to a boil, reduce to a simmer, cover, and continue to cook until the potatoes are tender, another 5 minutes or so. Stir in the chickpeas and cook until chickpeas are hot. Taste and add salt as desired. Serve over a pile of sauteed greens and top with a sprinkle of cilantro. Tips & Tricks: You could cook the potatoes in the tomato sauce for the entire time however, I’ve run into times when it takes longer to cook the potatoes until tender. I make a semi-mild harissa sauce but also occasionally buy harissa in a jar. Both of these work well for the quantity in this recipe. However, some harissa paste can be spicy and you may only need 2 to 3 teaspoons. 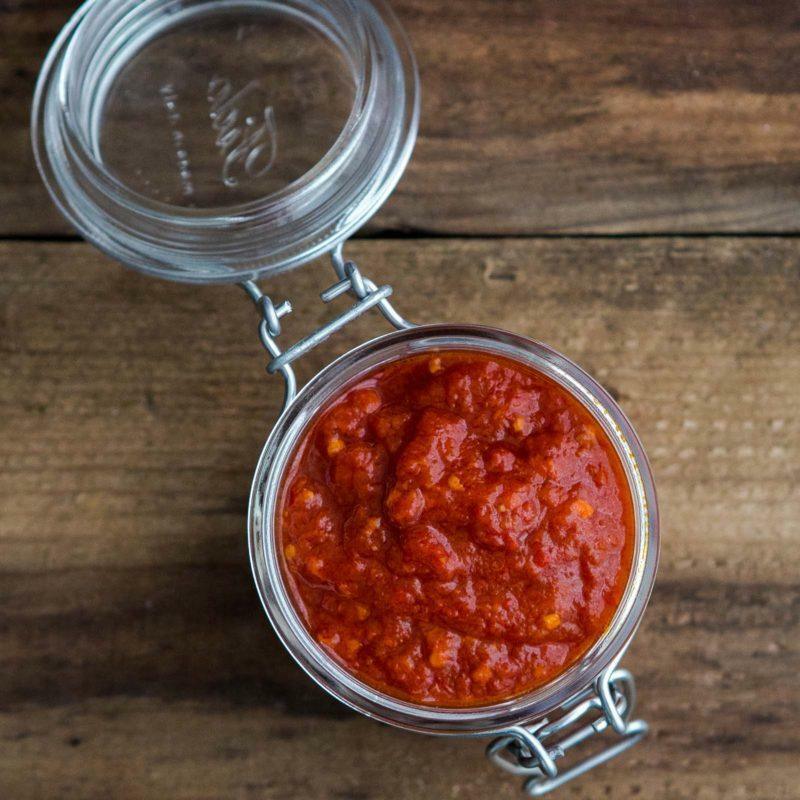 Taste test your harissa first to find out how spicy it is and go from there! For the greens, I like to use garlicky kale. I love this recipe because it’s an easy dish to mix and match components. Don’t want the greens? Use grains. 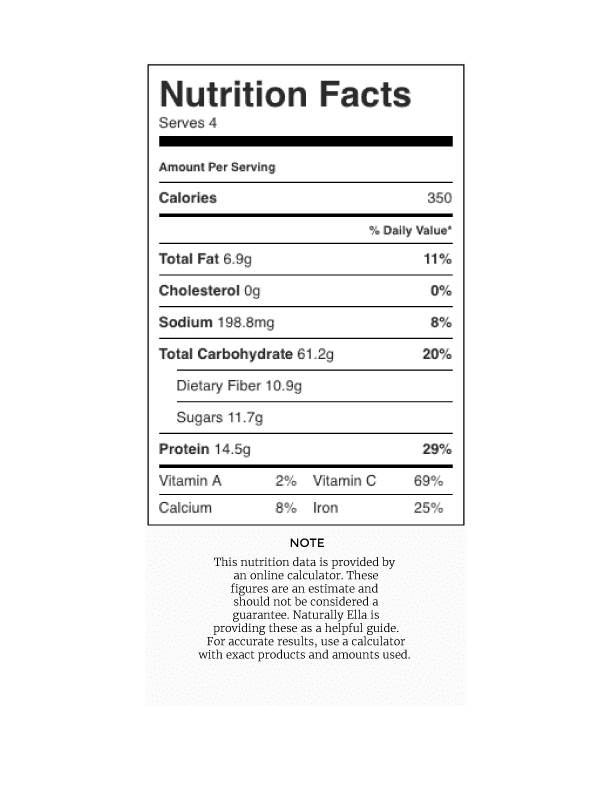 Have different legumes on hand? You can use those too. You could make this recipe with multiple variations and never get bored. 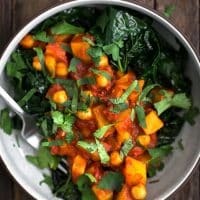 Greens: Instead of serving the harissa potatoes on top of the wilted greens, you could stir the greens into the pot along with the chickpeas. Kale, chard, collards, or spinach would all be great options. Grains: Serve this dish atop a bed of your favorite grains- quinoa and millet are two of my favorites to pair with the harissa. Legumes: Instead of chickpeas, you could use cooked lentils or white beans. Sweet Potatoes: Swap out the potatoes for 1/4″ diced sweet potatoes. Toppings: I left this vegan but you could easily serve with a dollop of yogurt or a sprinkle of feta. I love the flavors of harissa. I make mine on the mild side but you could easily ramp up the heat level with the use of hotter peppers. You can find a couple store brands in some specialty stores but I’ve found it’s easy to make my own. I like to make a big batch and freeze in smaller portions. Harissa foreverrrr! Can’t wait to try this one out! It looks delicious… Thanks for this recipe! I imagine that these would be perfect the next morning with a poached or fried egg! Ive never used harissa and just made this dish using the harissa recipe provided. It is sooooo yummy! This will become a regular dish in my house. Thank you! !